GESAMTKUNSTWERK (Geh-ZAHMPT-kunst-verk): A German word that translates to a “total work of art. ” It is used in English to describe an aesthetic where all elements of a design are treated as a whole. In other words, designer considers a building’s shell, furnishings, accessories and landscape as part of the complete design. Gesamtkunstwerk has been a design approach (even if not called by this term) for centuries. Artists as early as Michelangelo favored this aesthetic. It enjoyed a resurgence in the mid 19th century when German composer Richard Wagner used it to describe a new type of opera. 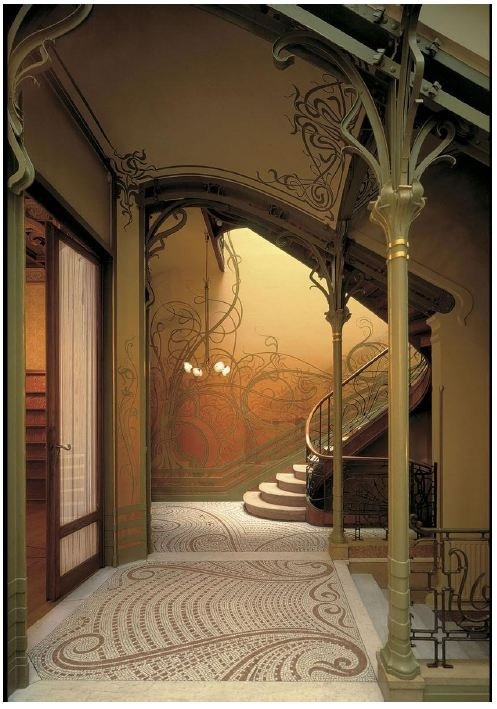 During the late 19th and early 20th centuries, proponents of the Art Nouveau style, like Hector Guimard, and members of Wiener Werkstatte, like Josef Hoffmann adopted the aesthetic. Frank Lloyd Wright was another big proponent. More contemporary designers also follow it. Gesamtkunstwerk has been criticized by some as too rigid because it does not allow for change. For example, imagine if your dining room was the dining room by Charles Rennie Mackintosh shown above. What happens down the road when you decide to add a new pair of candlesticks to the table or lamps to the sideboard? Note how the medallions on the chair backs, the rug and the swirls in Gustav Klimt’s painting all relate to one another. Wright designed all that you see: the building, furniture and lighting. The lamps are part of the dining table. Jacobsen designed the SAS Royal Hotel Copenhagen from the building all the way to the flatware. Johnson did not design all of the furniture in the Glass House but the entire structure, including its contents, was conceived as a complete design with direct correlation to the outside. The only painting inside the Glass House inspired the landscape design. Do designers follow gesamtkunstwerk today? I think so. 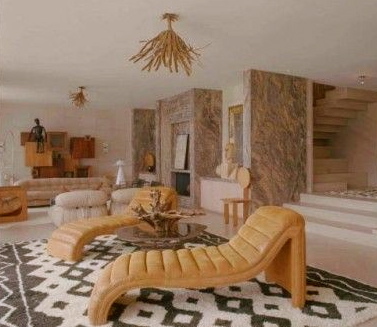 In my opinion, the aesthetic certainly influenced Kelly Wearstler’s design for her much-publicized Malibu beach house. All of the colors and textures mirror the outside landscape. You are confronted with the sea, and the home is an organic part of the beach, no different than the sand around it. The interior colors are all sandy shades of beige and gray. The expanse of glass in the living room is like the Glass House, blurring indoors and out. Wearstler’s furnishings echo the outside. In the living room, she chose chaises with curves that recall waves. Wearstler saw the shape of seaweed in the chandelier. Other furniture choices continue the sea theme. For example, the guest room headboard features the mythological figure Medusa, who was raped by Sea God Poseidon. Wearstler’s accessory choices, like the large piece of driftwood placed as sculpture on the coffee table and the giant fossil in the entry that resembles a large shell, also help tie the building and its contents with the outside. Although Wearstler did not construct the building’s shell but she did oversee an extensive two year renovation, which included raising the kitchen so it would have ocean views and designing a deconstructionist staircase. I think the staircase can be seen as a metaphor for the unstructured life she likes to lead while relaxing at the beach. What do you think? Was Kelly Wearstler influenced by gesamtkunstwerk? Can you think of any other designers today whose work embodies gesamtkunstwerk? Photo credits: Mackintosh Hoffmann Horta Wright Jacobsen Johnson, my own. Wearstler via Metropolitan Home, Elle Decor and InStyle.